WEDNESDAY, OCTOBER 26: Hopes that bigger cruise ships might come to the rescue of our flagging tourism industry appear to have run aground. There’s no money to pay for vital dock improvements — even if Government goes ahead with plans to widen Two Rock Passage. The municipalities say their coffers are dry and the only hope of finding funds would be through public/private partnerships. City Mayor Charles Gosling said preparing the Hamilton waterfront for modern large liners would cost at least $200 million. And in St George’s, Mayor Kenneth Bascome said there is no cash to improve docking, even if Town Cut was widened. Mr Gosling was speaking after Transport Minister Terry Lister said that any scheme to open up Hamilton Harbour would depend on the City of Hamilton backing the widening of Two Rock Passage — a Government responsibility — with improved docks. Mr Lister stressed that improvements to access to Hamilton and St George would depend on partnerships with local government in both areas. Mr Gosling responded: “That’s very much our position and we would love to engage in that conversation. I would expect this to be a partnership — there’s no way the City of Hamilton could pay for this on its own. Mr Gosling added: “We would need Government permission for any reclamation work and we would need Government help to go out for funding. But Mr Gosling stressed the City’s inability to pay for the massive work which would be required did not rule out bigger ships in Hamilton Harbour — although he declined to go into details about who might help with funding. He said: “There is more than one way to skin a cat and this is a perfect example of there being many opportunities to solicit funding and various different ways the pie could be cut. 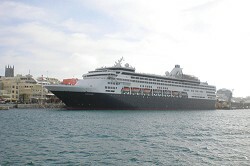 Accommodating bigger ships is seen as important because of industry trends — there is a small and dwindlng number of ships small enough to serve Bermuda. But he said that cruise ship operators could be persuaded to pay for the bulk of the work — in return for sweeteners to make it worth their while. Mr Bascome added: “If it was determined that the principals were in a position to supply St George’s with a suitable ship and if the community has been consulted and approved, I believe we could then sit with these principals and afford them the opportunity to have exclusivity to the port for a period of time. “That’s an option — and Government could even say to them that they could look at not eliminating taxes, but certainly giving them a tax break. The Cayman Islands government is expected to sign a deal with a Chinese firm next month to build a $300 million dollar cruise ship terminal. The Chinese company will shoulder the cost in return for a 49-year management deal to allow it to recoup its investment. Transport Minister Terry Lister said: “Our position right now is trying to work through if we can find locations suitable for everyone. How we partner and who we partner with is still a way down the road.